Being able to work from anywhere in the world at any given time is, in a word, awesome. And thankfully, there are lots of great collaboration tools out there that allow teams to work remotely while enhancing productivity and efficiency. At minimum, these tools should help bring your team together and enhance the way you work. But there’s more to working remotely than just having the right collaboration tools in place. Good virtual team managers must foster team building, effective communication and group cohesion. So how do we get every team member on the same page? 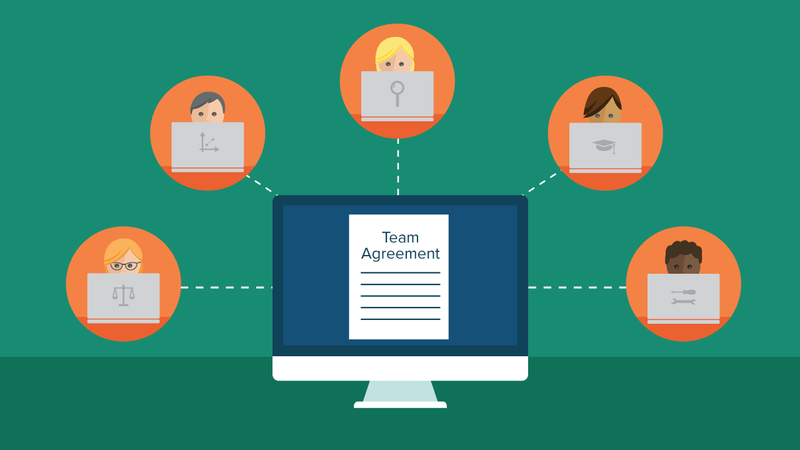 Start by creating a “team agreement.” This is a living document that sets expectations and captures agreements about how a remote team will work together. What kinds of information do you need to share? Do you need to work on documents together? Do you need a way to share tasks or calendars? Do you need to document decisions in wikis? Determine how your team needs to access this information, and who will have access to various projects or assignments. How will you communicate with each other? Some tools have an internal messaging system, are are flexible with different communications styles. For instance, some people might prefer having live discussions in-person, over the phone or via video chats, and others might prefer email or instant messaging. The bottom line is that if everyone is communicating in different ways from different places, there will probably be challenges. Having discussions regarding communication styles up front and including them in your agreement will help everyone understand the needs of other team members. What are expected response times? When you send an email to a colleague, what will reasonable response times be? Do you need to know the whereabouts of other team members? If so, how will you communicate that with each other? Some companies agree to keep their Skype open during the workday with the status updated at all times in order to help team members know who is available. How will you know what projects or assignments are being worked on? Some companies have a daily stand-up meeting. Other organizations use a community blog to keep each other up-to-date. Many find that online project management tools provide the best solution for project tracking. Do you need to set core hours or can the work be done asynchronously? Does your team work in different time zones? I recommend deciding on a common time zone language for everyone involved. For example, I live in The Netherlands and work every day with a woman in California. We’ve agreed to always talk in Pacific Time in order to avoid confusion with our scheduling. How will you give each other feedback? Virtual teams have less face-time with each other than traditional work groups, which means its important to focus on how to give each other constructive feedback. Some teams host weekly retrospectives. Some agree that any hot button topic will be dealt with using video calls instead of sending emails. Learn more about each other’s personalities. It’s important to get to know your team members. Consider utilizing tools like Prelude, an interactive game for virtual teams that uses a mix of psychometrics and creativity to help foster team member rapport and trust. There are, of course, more issues or topics that can be clarified as you go, and this will happen over time as the team continues to grow and develop. I find that it’s helpful to ask at least one person to keep the agreements documented and updated on a regular basis. Each team has its own unique way of communicating and a particular combination of personality types. And just like an orchestra tunes up before a performance, or an athlete warms up before a practice, tuning your virtual team helps get everyone on the same page so you can do great things together. Have you ever been involved in creating a team agreement? Was it beneficial? Please let us know about your experiences with working on virtual teams. What are additional ideas for keeping a virtual team united and focused on the same goals? Leave your comments below. Lisette is the Director at Collaboration Superpowers, a company that helps teams work together from anywhere. She is also the remote team manager for the all-remote freelance team at Happy Melly.